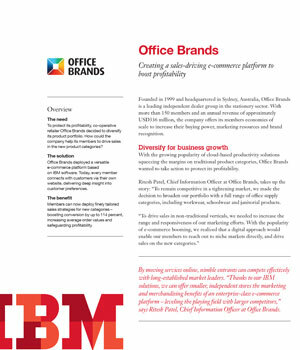 Introduction: To protect its profitability, co-operative retailer Office Brands decided to diversify its product portfolio. The client wanted to help its members to drive sales in the new product categories. Challenges: To drive sales in non-traditional verticals, they needed to increase the range and responsiveness of their marketing efforts. With the growing popularity of cloud-based productivity solutions, they needed to migrate into eCommerce solution. Solution: Royal Cyber deployed a versatile eCommerce platform based on IBM software. Today, every member connects with customers via their own website, delivering deep insight into customer preferences.